Some public art projects move from initial concept to the completed work on site, perhaps not exactly easily but with a natural progression through the issues that develop solving problems as they arise until the final sweep and tidy up, photographs taken and then leaving the work for others to enjoy. Some other projects take a more torturous route! The artwork proposals I developed for the new Hillcrest Housing Association Headquarters in Dundee was one of these. Designed by Head Architect Gerry Farquerson of Nicoll Russell Studios in Broughty Ferry the headquarters are an innovative multi award winning design that matches natural materials with cutting edge construction methods to provide a building of high sustainability and market leading low carbon design. Built in a corner site within the city’s Technology Park, the brief was for an external land artwork that worked with the building in the space between the main road and the ‘gabion’ basket roundel tower that is the striking feature of the building. Art proposals and revisions came and went, marrying a landwork with the building was proving to be a major challenge which created more problems and design conflicts than anticipated. My philosophy is that my role is non confrontational and that the design process is a dialogue between the requirements of the client and the artistic ambitions of the artist, a fluid investigation of what works for both parties. The site allocated was tight for space and had a height difference of over 4mtrs from top to bottom – the main problem I had was that any sculpting of the levels increased the negative effects this created on site. Each idea that I investigated never seemed like the solution I was getting increasingly frustrated and disillusioned that I wasn’t achieving what the clients desired. More and more pages of ideas were being dismissed, though the concept of turning the whole area over to allotments did have a certain subversive charm! Getting nowhere with the ‘Landform’ concept, I started working through some sketches using beech hedging for the work. 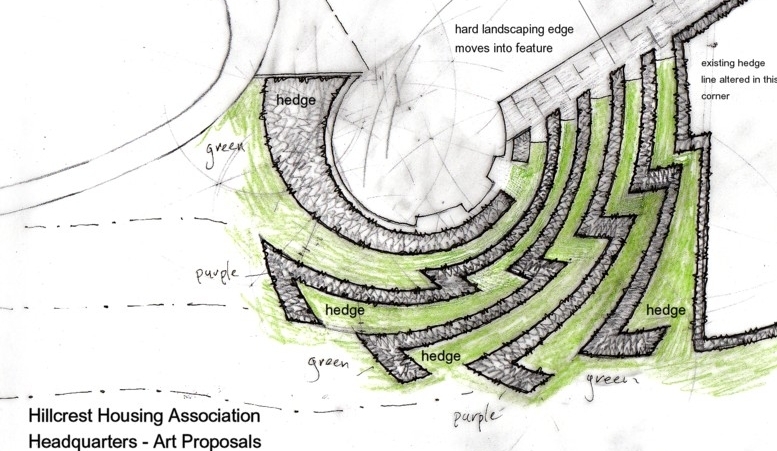 Creating banks of two different colours of plants to fill the area with different tiers of hedges forming a strong patterned bank of planting to set of the building. 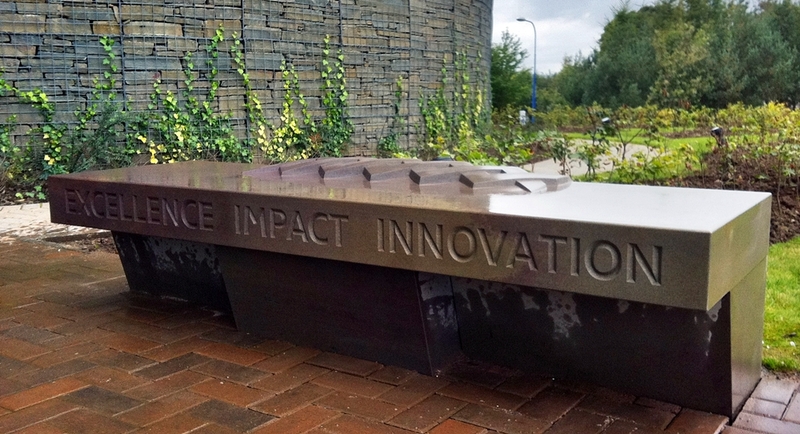 This concept found favour with the client group and offered a cost effective solution for the site which freed up some funds which the client proceeded to commission me to carve a stone bench for outside the main entrance to the building. Blocks of ‘Minetrain’ sandstone were cut and supplied by Tradstocks and the inscription was ‘V’ cut by myself. Reflecting upon the completed project I felt an awkward sense of unease over the results. 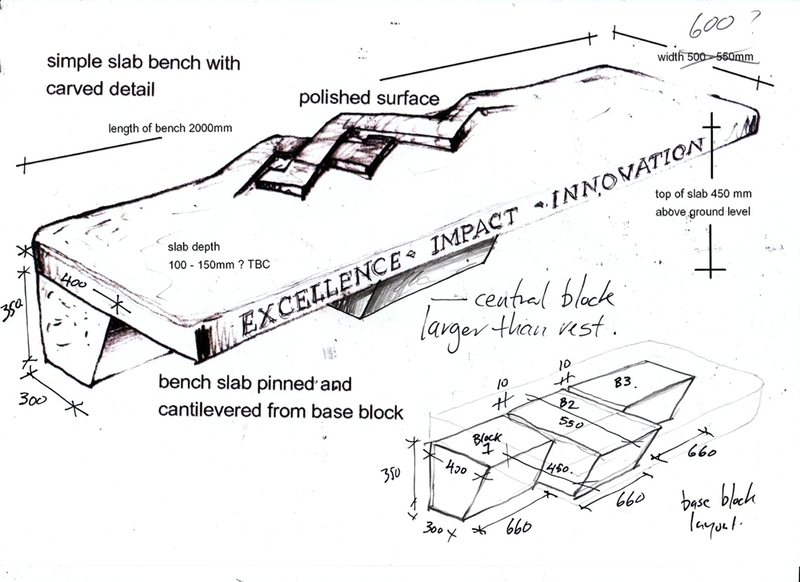 Had I been initially been appointed to supply the bench I would have been very happy with what was achieved, but a ‘Sculpted Landform’ had been the brief – had I failed? was an opportunity missed? Given that the hedges will take a few years to establish their full impact perhaps I will have to wait a bit longer to have my answer.